Emirates revealed its ICC Cricket World Cup 2019 themed Emirates A380 livery in the build up to one of the world’s most anticipated sporting events this year. Former India cricketer and ICC Men’s Cricket World Cup 2011 winner, Virender Sehwag, and Emirates sponsored Lancashire team players Saqib Mahmood and Tom Bailey helped to marshal the newly emblazoned aircraft out of the Emirates Engineering hangar. 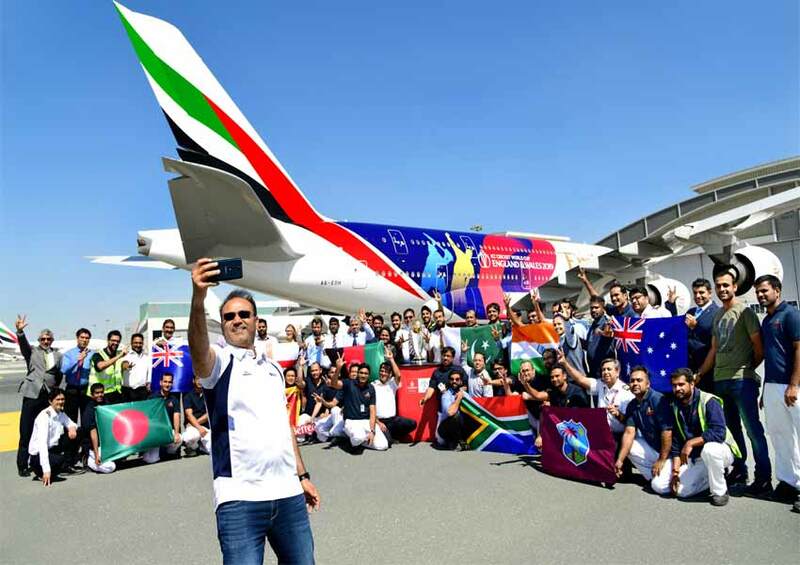 The cricket players were accompanied by Emirates Engineering staff who had worked on installing the decal, and who were later treated to a game of mini-cricket by the aircraft. The ICC Men’s Cricket World Cup trophy also made its debut at Emirates Engineering earlier this morning, and excited employees got the chance to take photos with the iconic trophy. The attention-grabbing ICC Men’s Cricket World Cup 2019 decal covers a substantial area of 694sqm on the Emirates A380 fuselage and includes player silhouettes batting and bowling against a backdrop of vibrant shades of purple and pink. The decal was installed on A6-EOH, which is scheduled to fly today to London Heathrow in the UK, the host nation of the ICC Men’s Cricket World Cup 2019. Over the next few months, the aircraft is expected to fly to other UK points including Manchester and London Gatwick. Cricket fans and aviation enthusiasts alike can also look out for the aircraft landing and taking off in Johannesburg, Mumbai, as well as Emirates destinations served by the A380 in both Australia and New Zealand.